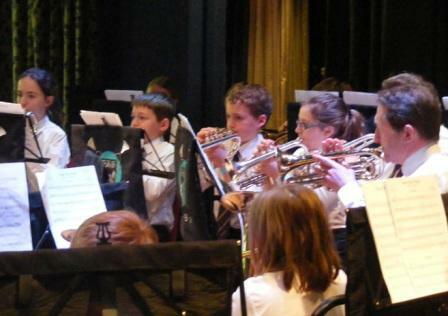 With Senior and Youth bands joining to put on a Christmas concert this year at the Borough Theatre, the audience was sure to start Christmas with a Band. Many festive favourites encouraged the sing along and foot tapping to bring everyone into the Christmas mood. MD Craig Roberts Senior Band programme delivered a platter of seasonal music interspersed with pieces played in performances thro ughout the year. This was particularly poignant as 2014 saw the 70th anniversary of the D-Day landings and the centenary of the start of WWI. Fitting then that the band featured "Lest We Forget", a piece written especially for the band by composer Dave Collins and based around the themes of the Last Post and Reveille. But there was also plenty of great Christmas music with Santaclaustrophobia and Jingle Bells as well as A Christmas Song. Then there were the youth Band, led by the inimitable Lana Tingay, who gave us Rudolph, Twelve Days of Christmas as well as some well known carols for the audience to join in with. Christmas continues through December with the band at several venues in the town. We are very excited to be participating in Abergavenny Food Festival on Sunday 14th December and will be playing Christmas music outside the Market Hall from 2:30 to 3:30pm. Then we will lead the procession of singers and children to St Marys Church at 4:15pm playing some well loved Christmas pieces along the way. Our trip to Merthyr for the SE Wales November contest was not to be a repeat of the success enjoyed at the previous contest in Fishguard. Playing own choice test piece Tallis Variations for the second time the band failed to capture the detail that adjudicator, Derek Broadbent, was looking for. This spoiled what was otherwise a good performance. However he did compliment our “pleasing and confident” Solo Cornet, “tasteful” Flugel, “fair” Horn and “bold” Euphonium players. We were also very pleased to welcome back to the band guest MD Alun F Williams who stepped in for Craig Roberts who was in Canada on business. The band would like to thank Alun for his help and hard work preparing the band for the contest. The band finished the day in sixth place with Pontardulais securing the championship section 1st prize. Why not join us for our annual Christmas Concert and get right into the festive mood. The band will be playing a great selection of well known and love Christmas music at the Borough Theatre, Abergavenny on December 6th at 7:30pm. You're bound to start your Christmas with some up beat, foot tapping rhythms that will guarantee a memorable musical evening and launch your festive celebrations. 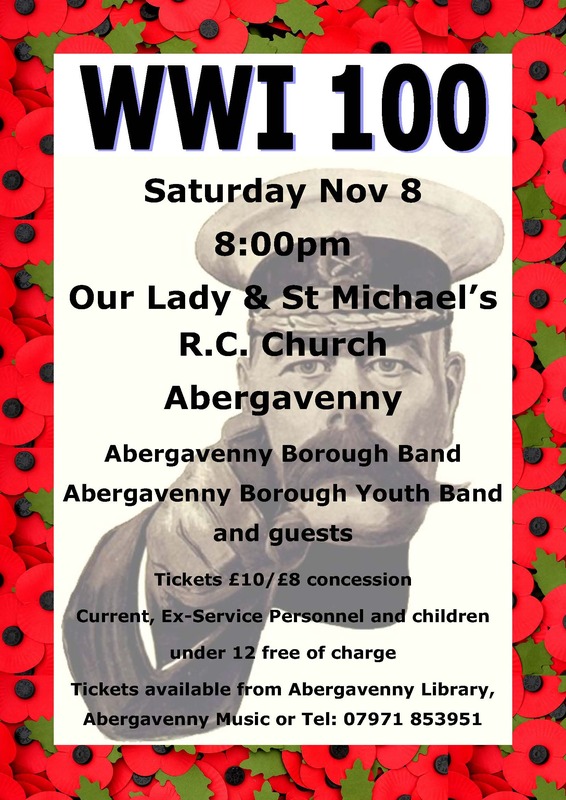 Our Senior and Youth bands combined forces to perform a Word War 1 memorial concert on 8th November. Originally planned as a “Flashmob” event in the town centre followed by a concert, the inclement weather meant the entire event had to be stage indoors. We are very grateful to Our Lady and St Michaels Church for allowing use of their premises free of charge for the evening. The event was sponsored by Superacts’ “Last Post Project” which provided funding across the UK for events that feature a performance of the Last Post. The band featured a work by composer Dave Collins, inspired by the 70th anniversary of the Second World War D-Day landings and the selfless sacrifice of those involved. Entitled, ‘’Lest We Forget’, it features the Band with accompanying offstage buglers who play the Last Post.The evening was made the more memorable with the attendance of members of the Royal British Legion who paraded the standards in readiness for the Last Post at which they were lowered as a mark of respect. The band wishes to thank everyone for attending and the Church for its welcome support. In what has now become a great social event for the band, the bi-annual trip to Fishguard for the West Wales Brass Band Association Championships proved very worthwhile as the band secured 2nd place in the Championship section. Playing Tallis Variations (Philip Sparke) the band delivered a controlled and well balanced rendition of this own choice test piece which gave adjudicator, David Roberts, much cause for praise. In a strong field which included City of Cardiff (Melengriffith) band and Llwydcoed who had recently competed in the British Championships, it was very rewarding to secure second place behind Burry Port Band. The adjudicator stated that the band had delivered a neat and controlled performance over most that had performed at the contest. Band Chairman, Andrew Richards commented "this was a great result for the band and a nice reward for all the hard work in rehearsal everyone had put into the performance". The band then went on to enjoy a social evening at the Phoenix Centre and then at our hotel before returning home on Sunday. The band would like to thank the WWBBA and members of the Goodwick band for a superbly well organised contest. It all started on Friday evening (6th June) with an intense rehearsal taken by our guest conductor, Harald Hepner Musical Director of the Jugendsinfonieorchester Ravensburg, Germany. This is the third consecutive year that the Band has been privileged to work with Harald and to have him conduct us for the D-Day 70 memorial concert the following day was to be a great honour. The D-Day 70 concert was a great success with a capacity crown enjoying the music from the band, Llanfoist Fawr Primary School, the Youth Band and soloists Maggie Pratt and Keith Purkiss, both long-standing members of St Mary’s Priory Church Choir. As you’d expect the programme was entirely designed to evoke memories and stir emotions. The concert was dedicated to all who served in all the forces and included such pieces as; The Dambusters March, The Great Escape, Hymn to the Fallen, The Army, the Navy and the AirForce, Blue Birds Over and A Nightingale Sang in Berkeley Square. The concert concluded with the Royal British Legion Standards being lowered to the Last Post which featured in the world premiere of Dave Collins evocative piece “Lest We Forget” with narration by Lewis Wilkinson read by Craig Roberts and buglers Diane Mogford and Louise Russell. Then, the following morning, it was off to the Millennium Centre in Cardiff Bay to perform under the baton of Alwyn Humphries MBE, who led massed choirs and the band in a Cymanfa Ganu in the Glanfa foyer. 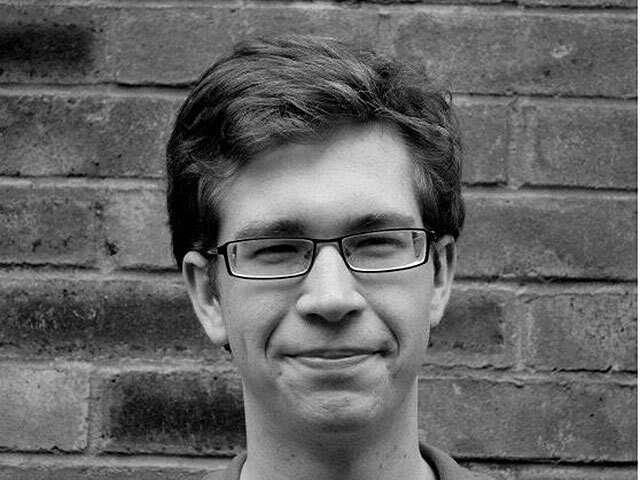 Alwyn Humphreys combines two busy careers as a television presenter and choral/orchestral conductor. 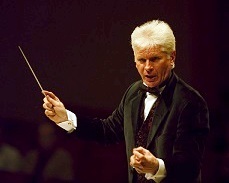 He is Conductor Emeritus of the Morriston Orpheus Choir and Principal Guest Conductor of the Chamber Orchestra of Wales. The last time the Band played for Alwyn was at the Millennium Stadium in 2012 when Wales played the Barbarians. Once again our youth and senior bands participated in the same contest, this time at the Rhydycar Leisure Centre, Merthyr on Saturday 17th May. 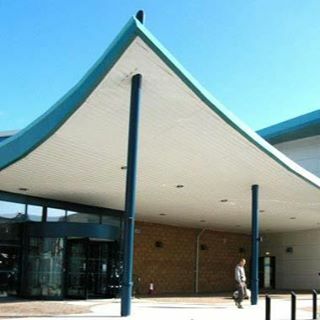 This is the first time the leisure centre hosted the competitions and it proved to be an excellent venue with great facilities in and around the centre. The youth band started proceedings having been drawn to play first in the junior section on the day. Adjudicator, Mike Kilroy, thoroughly enjoyed the programme which comprised of Liberty Bell, The Rose, Delilah and 500 Miles. He praised all sections of the band congratulating them on their ensemble, dynamics and rhythmical playing. The youth band came away with a silver award and the prize for the best percussionist on the day. The senior band didn’t fare so well only coming 6th in the Championship sections with their performance of Martin Ellerby’s Chivalry. A joint adjudication this time with Ian Porthouse and Mike Kilroy pointing out mainly interpretive problems within the performance. Mike Kilroy also looked for much more care and focus in our playing to bring out all of the opportunities that are contained within the score; whereas Ian Porthouse commented on an overall performance that had good energy but needed channelling in a more subtle way. MD Craig Roberts stated that despite the result, the band delivered an excellent rendition of the music and had improved significantly over the playing at the last contest in Llandudno. A new work by composer Dave Collins, inspired by the selfless sacrifice of those involved in the D-Day landings will be premiered in Wales. Inspired by the 70th anniversary of the Second World War D-Day landings the music will be premiered in Wales on June 7th by the Band during its concert at St Mary’s Priory, Abergavenny. Entitled, ‘’Lest We Forget’, it has been written by composer Dave Collins and features the Band with accompanying offstage buglers and spoken text by writer Lewis Wilkinson. 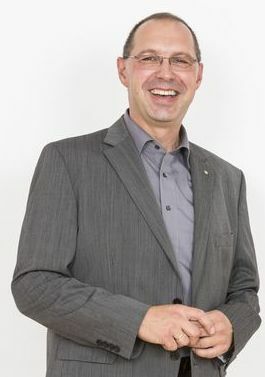 As part of the long term building of reconciliations and friendship between the twinned towns of Abergavenny and of Oestringen in Germany, the performance itself will be directed by guest conductor Harald Hepner, Director of the Stadtorchester and Musikschule in Ravensburg. Dave Collins commented “Lewis and I are very excited for this work to be premiered by Abergavenny Band as part of this incredibly moving concert.The work reflects our admiration of those who gave the ultimate sacrifice protecting this country, but also acknowledges the violence, horror and destruction caused by war." The Band’s MD, Craig Roberts added: "We've held a close connection with Germany for many years. Abergavenny is twinned with the town of Oestringen and the band itself will be heading to Nürtingen and Baden-Württemberg on tour this summer. I'll also be working in both Hamburg and Ravensburg, and with the D-Day anniversary and First World War centenary this year, we thought it the perfect occasion to invite Herr Hepner to Wales to conduct this concert and tribute to all fallen servicemen and women." The concert will also feature other music by the Band, who last year was awarded prestigious Ty Cerdd WS Gwynn Williams Award. On Saturday June 7, Abergavenny Borough Band will mark the 70th anniversary of the D-Day landings with a grand scale concert at St Mary's Church, Monk Street, Abergavenny, NP7 5ND. The concert will feature Abergavenny Borough Band, Soloists of St Mary's Church Choir, Abergavenny Borough Youth Band and Llanfoist Fawr School Choir. Tickets are just £10 / £8 concessions with complimentary tickets being offered to current and ex-service personnel, plus children 12yrs and under. The concert will be conducted by Abergavenny Borough Band Musical Director Craig Roberts together with guest conductor, Harald Hepner, Director of the Musikschule of Ravensburg, Germany. 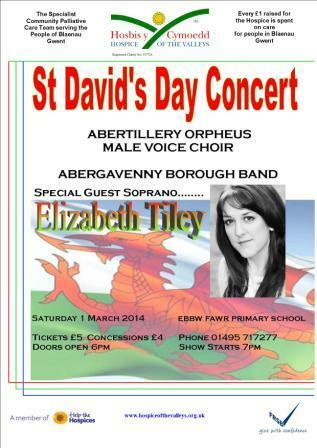 Abergavenny Youth will be conducted by Youth Band Musical Director Lana Tingay. 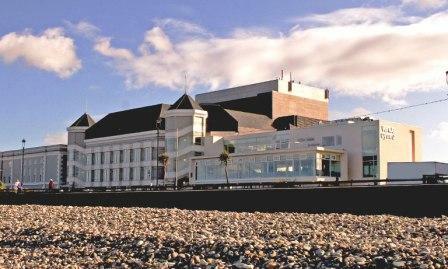 As Llandudno basked in the warm spring sunshine, brass bands from all over wales descended on Venue Cymru for the annual regional championships on 15th and 16th March. It was to be adjudicator David Reed’s last event as a Brass Band judge before retiring from the role. He said what we all felt in his comments at the end of the 1st section contest; that the test piece was no technical challenge but really tested bands musical ability and quiet playing prowess. He placed our performance 8th out of the nine contenders on the day and his adjudicators remarks seem to bear out his comments on stage; that we tackled the challenges well giving a “workmanlike performance”, praising the quiet playing but wishing we had given the piece “more expression and musical shape”. 4Barsrest tended to agree commenting that ours was “a performance that grew in stature, but it seemed a little off the pace today”. Band Chairman, Andrew Richards, commented “we probably left the best performance in the rehearsal room, but never the less I think we rose to the occasion and met most of the challenges presented by the test piece. Expression and musicality are very subjective areas but I’d agree, we could have performed better on this aspect of the music”. After 26yrs Band President, Ray Hill, has stepped down at this year’s AGM. Ray recalled the day officers from the band called at his house to invite him to take up the position and said it was one of his proudest moments. Ray has been a keen supporter of the band and has worked hard to represent us in the town. He can always be seen collecting in the town when the band plays to raise funds and takes every opportunity to promote the band locally. But Ray will continue his long association with the band as he has agreed to become one of our vice-presidents. Our new president was elected at the AGM and the band is proud to announce that local businessman, Alun Griffiths of Alun Griffiths Contractors Ltd., has taken up the position. Founded in 1968 and still privately owned, Alun Griffiths (Contractors) Ltd is one of the leading civil engineering and construction contractors working in Wales, the English border counties and the West Country. Its head office is in Llanfoist near Abergavenny. Band Chairman, Andrew Richards, said the whole band is extremely grateful for the years of dedication Ray has given the organisation and we are delighted he will continue as a Vice-President. Everyone in the band is also excited and honoured to welcome Alun as our new President and we look forward to a long and happy future together. Other vice-presidents elected at the AGM were former band secretary of 10 years, Gareth Havard and his wife Sharon. Gareth and Sharon became associated with the band when their daughters joined the youth band and have always been keen supporters and hard workers for us. The recent spell of extremely bad weather abated to allow bands to compete at the Welsh Open Entertainments Con test on Porthcawl today (15th February 2014). The band selected an exciting programme, an eclectic mix of musical styles, opening with some Latin rhythms in Los Hermanos De Bop. Louise Russell then featured as our Flugel Horn Soloist in the second piece, Faith. by George Michael arranged by Cory MD Philip Harper. Louise was roundly congratulated by adjudicator, Stan Lippeatt for some fine Flugel Horn playing. Adjudicator, Stan Lippeatt, praised the soloists throughout the performance and congratulated the band on some exciting playing and a good choice of music for an entertaining programme. MD, Craig Roberts commented that the band delivered a confident and well rehearsed performance. He added that the adjudication was very fair and there were no real problems of balance and intonation which was very positive. The band now has to concentrate on the Welsh Regional contest in Llandudno in March. Well done to all our young players in the Youth Band who travelled to Ross-on-Wye on February 2nd to take part in the Gloucester Brass Band Association Entertainments Championships. Winning a silver award for their performance was a great reward for all their hard work in the weeks before the contest. Opening with Souza’s Liberty Bell March the youngsters followed with two pieces more fitting for a Welsh Band; Delilah and the Welsh traditional air “Suo Gan”. The Proclaimers “500 Miles” then had the audience stomping away before the solo cornets played the beautiful love song “The Rose”. More hand-clapping for the final piece “Amarillo” delighted the packed auditorium. Adjudicator, Ian Porthouse, congratulated the youngsters on their beautiful and tuneful playing and MD Lana Tingay on her choice of programme that suited the band very well. 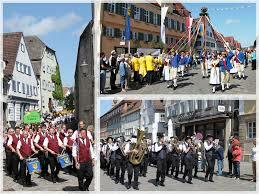 A mix of concerts and contests is planned for 2014 which will keep the band very busy throughout the year ahead. The local contesting round commences on February 15th in Porthcawl with the Welsh Open Entertainments Championships closely followed by Welsh Regional Championships, Venue Cymru, Llandudno on 15th March. Preparations are already well advanced for this trip and players are working hard to polish the test piece for the day, Cry of the Mountain. May 17th will see the band in Ebbw Vale for the South East Wales Brass Band Association Championships. The penultimate contest of the year will take us to Fishguard overnight on October 4th for the West Wales Brass Band Association Championships before closing the contest season with a visit to Blaenavon in November. Of course, this year marks the 70th anniversary of the D-Day landings and the centenary of the start of the 1st world war. 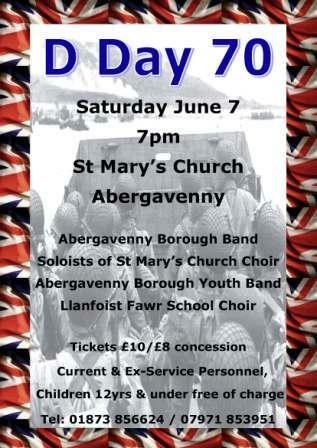 A special evening concert is planned for June 7th - D-Day 70 with Abergavenny Youth Band, Senior Band and Choristers from St Mary’s Priory, Abergavenny. Continuing with the commemoration there will be a spectacular parade through the town on Saturday June 28th led by the senior band. As winners of the prestigious W.S Gwynne Williams award in 2013, we will again be participating in the Ty Cerdd conference on Sunday June 8th. Joining in the Cymanfa Ganu, the band will be performing arrangements of 10 traditional Welsh hymns together with a massed mixed choir on the Glanfa stage of the Wales Millennium Centre, together with two or three stand-alone band items with a Welsh basis. 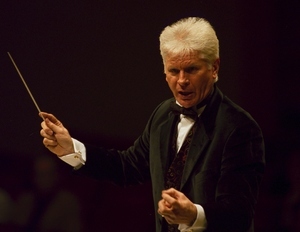 The band and choir items will be conducted by Dr Alwyn Humphreys MBE http://www.morristonorpheus.com/conductor-emeritus and the band by our MD Craig Roberts. In an added element it has been confirmed that the event will be recorded by the BBC for broadcast on BBC Radio Cymru. In late July, the senior band flies to Baden-Württemberg, as guests of the Stadtkapelle Nürtingen, for the 18th annual Nürtingen Tattoo. Each year the Nürtingen Tattoo takes the form of a large-scale open air performance held on specially constructed lit stages in front of the City Hall. Over 2,000 people attend the event which also features the 50 strong Stadtkapelle Nürtingen and the Ehingen Donau Pipe Bands.